I’m still waiting for the magic moment of parenting when I can delegate a bunch of the routine housekeeping chores to my children. I want them to learn to be competent, self-sufficient adults who can care for themselves, and naturally, it would make my life a little easier. We’re still in the stage where they have to be reminded 17 times to brush their teeth, put their clothes down the laundry chute, and clear their plates. They can perform all those tasks acceptably, but the effort on my part to remind them repeatedly wears me down. And of course, teaching them each new task involves time and effort, too. Clearly, I’m not the only parent who struggles with this. Did you see this blog post in the New York Times? All I can say is, I’m happy to report that my six- and nine-year-old can tie their own shoes (though my first grader tells me that not everyone in her class can do so). We’ve flirted with chore charts before, but they’ve always been paper charts, so that I needed to print new ones every week. I liked the customizable charts at Goalforit, but was forever running out of printer ink or forgetting whether I’d paid the agreed allowance. If your child is old enough to fill in the chart online, it could be a great tool. It just didn’t work for us. The other down side was that I had to assign sets of chores to specific kids, and then they would get tired of doing those chores or argue that someone else had a better slate. So I’ve been thinking about making some sort of reusable chore chart or system. Pinterest was a great resource for ideas. Most of the ones I found are a lot prettier than ours, but I don’t spend that much time crafting and I don’t have a ton of supplies. No stash of scrapbook paper, no Cricut machine, no assortment of craft sticks, magnets or chalkboard paint. I did not want to spend more at Hobby Lobby to make a homemade chart than it would cost to buy a cute finished one on Etsy. I finally settled on a magnetic memo board from Ikea. 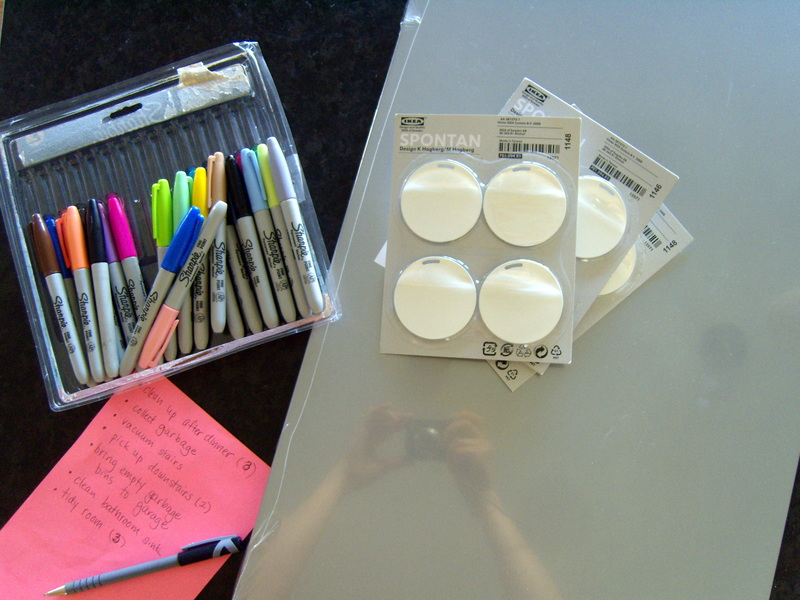 I also bought the coordinating magnets, which are conveniently large enough to write on. I didn’t have much of a plan before I started, but I pulled out my set of Sharpies and a ruler and jumped in. 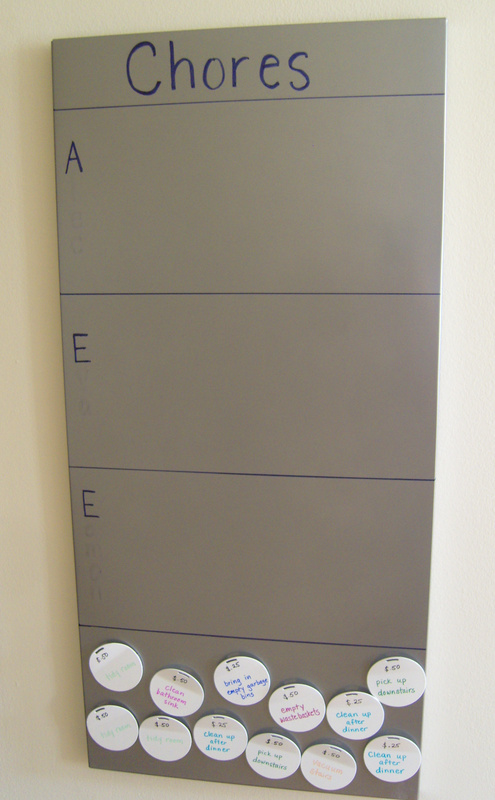 I drew lines to mark off a section for each child, and left a section for the unused magnets. I wrote a chore and its value on each magnet (there are multiples of some chores, like cleaning up the kitchen and tidying a room). Whenever they like, the kids can choose a chore to do and then put the magnet on their section. When I get around to paying them what they’re owed, I move the magnet back down. And from now on, they will use their earnings for school book orders and other small treats, or they can save for something larger. One week in to the system, it seems to be working. They like the element of choice (what to do and when to do it) and the ability to earn more for doing more. I like that I don’t have to calculate anything or remind, nag or bribe anyone. I have had to supervise and give some direction for some chores, but the older two have surprised me with their skills. I’m really optimistic that this system might last. 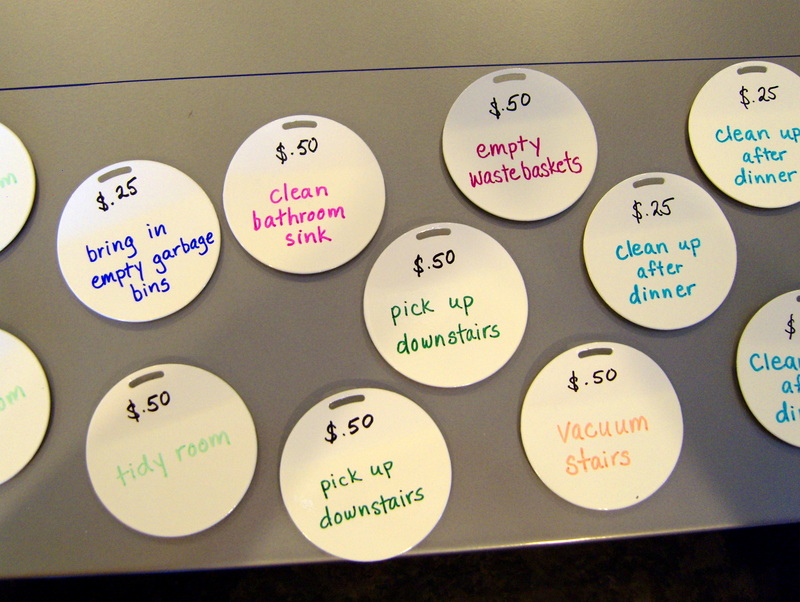 I can add and subtract chores from the chart as the kids grow. And just days after I hung the chart, all three kids had tidied their rooms, loaded the dishwasher and begged for a turn to clean the bathroom sink. It’s progress. Yeah, I bought it during an Ikea playdate! I LOVE this idea. I have a list- that gets checked rarely, but I really think you’re onto something with the choice piece…can’t wait to try.